701 W. 12th St. Pioneer Silas Horace Tracy; adobe c. 1870. YESTERDAY: Tracy home when owned by J.D.Pons; exterior adobe covered with cement; 2 front doors; photo Weber County Assessor c.1930. YESTERDAY: East front door closed in and porch added; photo Weber County Assessor, c. 1972. This was an adobe double-cell house composed of two roughly square units with two front doors and three front windows arranged symmetrically. The adobe walls were 18 inches thick. 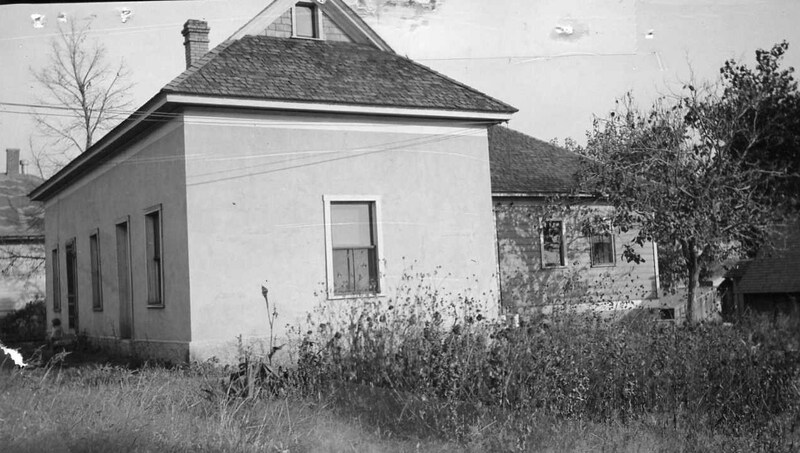 The house was one and a half stories tall with a large upper room that was used for community dances. 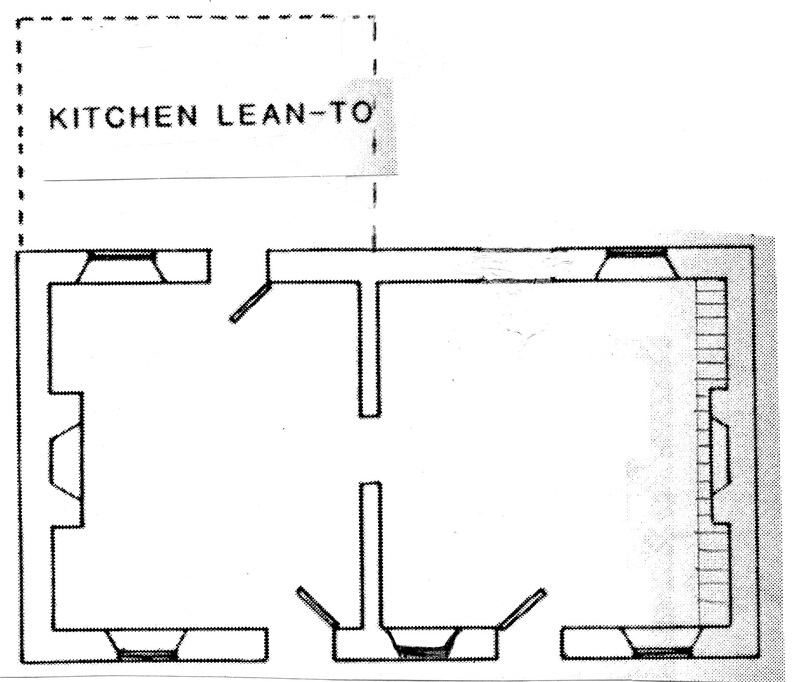 A lean-to kitchen was built on the rear. The two front doors were a common American form in the South and Midwest, with the double doors providing a balance of openings on the front façade. By the 1950s many changes had been made to the house. The adobe walls were covered with cement. One front door was walled in and the staircase was changed. The west wall of the house was solid rock, and Silas Tracy originally built a narrow rock staircase on this wall leading upstairs to the large room used for Marriott dances. The staircase was relocated and replaced with a new staircase with wider steps, and the large upper level was divided into two rooms. The kitchen lean-to was now a large cross-wing addition. Lower 12th Street was first named Tracy’s Bench for its first settler, Moses Tracy, who arrived in 1850. Moses was 40 years old, his wife 34, and they had 7 children. Moses first settled by the confluence of the Ogden and Weber Rivers, but this location was not ideal because of flooding, brush and nearby Indian camps. He relocated on higher land north of the confluence of the rivers, and they liked to call the new location “the bench”. To irrigate this land, Moses Tracy and Ambrose Shaw dug a ditch from Mill Creek that ran on the south side of 12th Street to the Tracy farm located about 7 blocks west of the present Wall Avenue; this irrigation ditch is still in use and is named the Tracy-Shaw Ditch or the Mound Fort #5. A compromise was made with Johnston’s army and the Saints returned to their log homes. Moses and family arrived back on July 4, 1858. Moses seemed to revive briefly but died on August 25, 1858, age 48. Nancy felt lonely and worn out. In 28 years of marriage they had left their homes in Ellisburg New York, in Kirtland Ohio, had been mobbed and driven from place to place in Missouri, and expelled from their home in Nauvoo. Finally they were able to claim this lovely farm, but now her husband was gone. 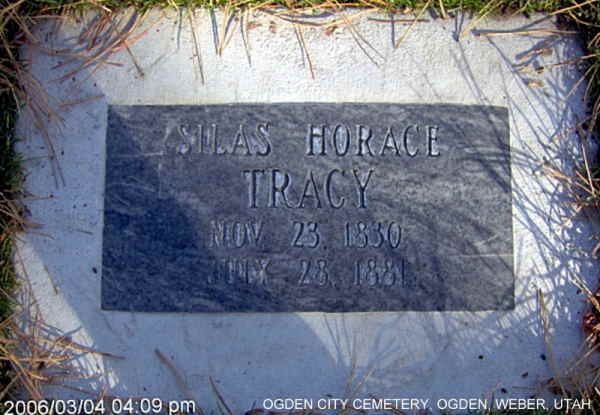 In 1859 Silas Tracy took a second wife. Nancy felt financially destitute and was not capable of running a farm. She was 14 years older than her brother-in-law but insisted that he marry her as a third wife. In April of 1860 Silas Horace Tracy married his brother’s widow, Nancy Naomi Alexander; they had one daughter named Nancy Marinda Tracy who later wrote her many fond memories of pioneer life on 12th Street. More families settled on West 12th Street, and in 1854 two men named Charles Zeimer and John Broom built another ditch on the north side of 12th Street called the Zeimer Broom Canal. This new ditch was longer and larger than the Tracy Shaw Ditch. Gradually the name of the bench-land changed from Tracy’s Bench to Broom’s Bench, and the enlarged community was named Precinct of Marriott in the 1878. In 1869 the Great Highway across the continent (railroad) constructed its way from the east and from the west towards a meeting place in Utah. That created a great heritage for Utah, but as bad luck would have it, the railroad was surveyed through the Tracy property, with the Moses Tracy farm on the east and Silas Tracy farm on the west, cutting out fine meadowland and orchard, and later bringing undesirable tramps. 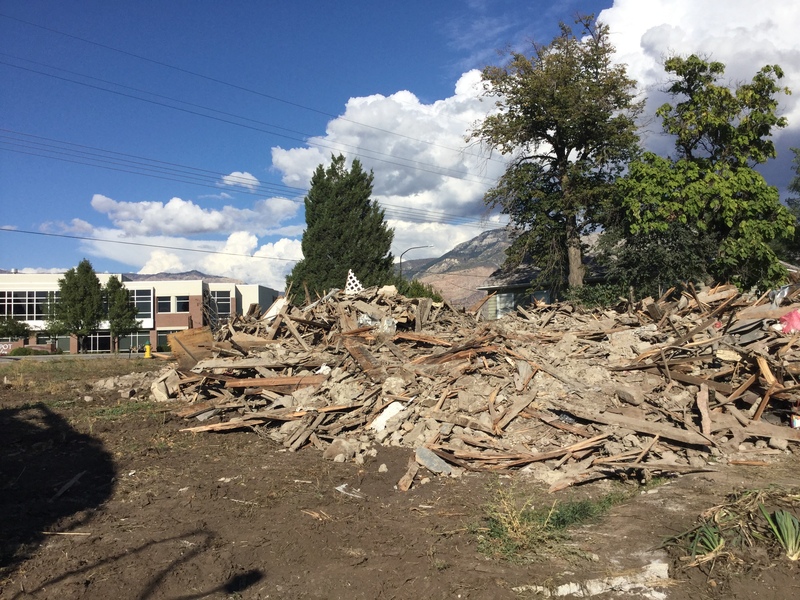 Prior to 1869, Silas contracted to grade a section of land for the rail road track between Ogden and Hot Springs and was paid $3000 for this work. 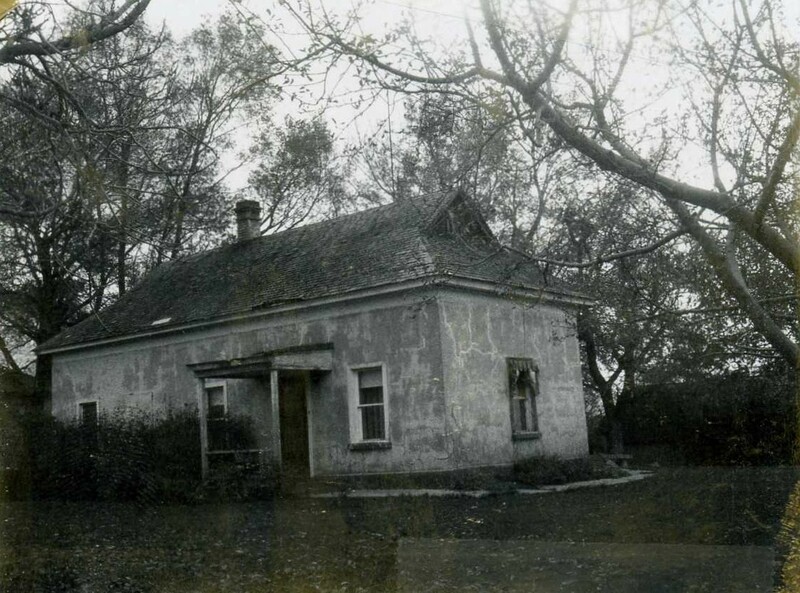 For $2000, in c. 1870 he built this large, attractive, adobe house for his wife, Nancy Tracy, and her children. 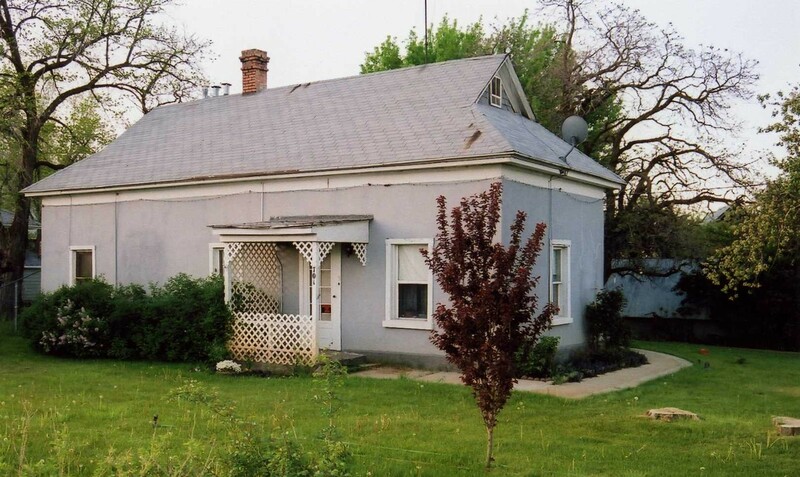 This two-door adobe house was a step up from the surrounding log cabins, and it benefitted the whole community with a large upstairs room that was used as a gathering place for community parties and dancing. 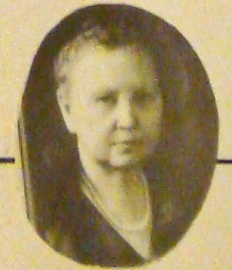 In 1875 Eliza R. Snow visited Ogden encouraging the sisters to establish home factories. The Relief Society sisters of Lynne and Marriott joined the Utah silk project and began nurturing silkworms. On West 12th Street a large lot was planted in Mulberry trees to grow leaves to feed the silkworms. The trees and worms were imported from Italy and France. Nancy Tracy was part of this project, and she placed a few worms (larvae) in an east room of this house but soon had thousands of them. They ate continuously for 6 weeks and made much noise. They would strip a branch of leaves in no time. 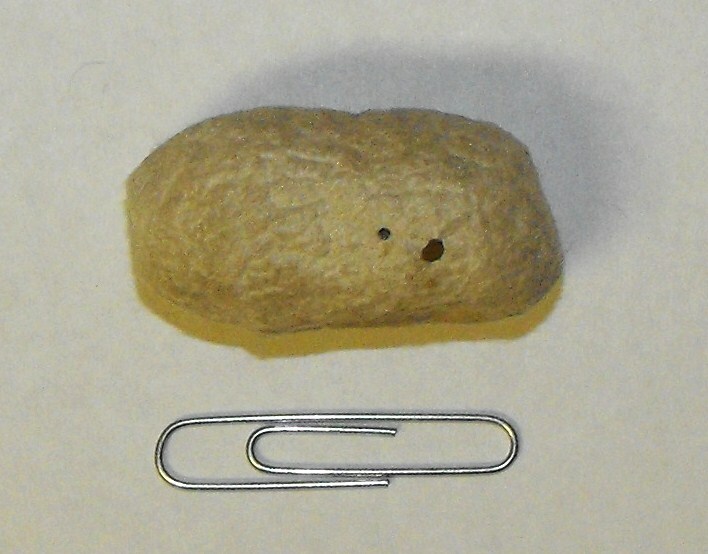 Then each larvae enclosed himself into a cocoon; a cocoon was made of a thread raw silk produced by the salivary glands and ranged from 1,000 to 3,000 feet long. 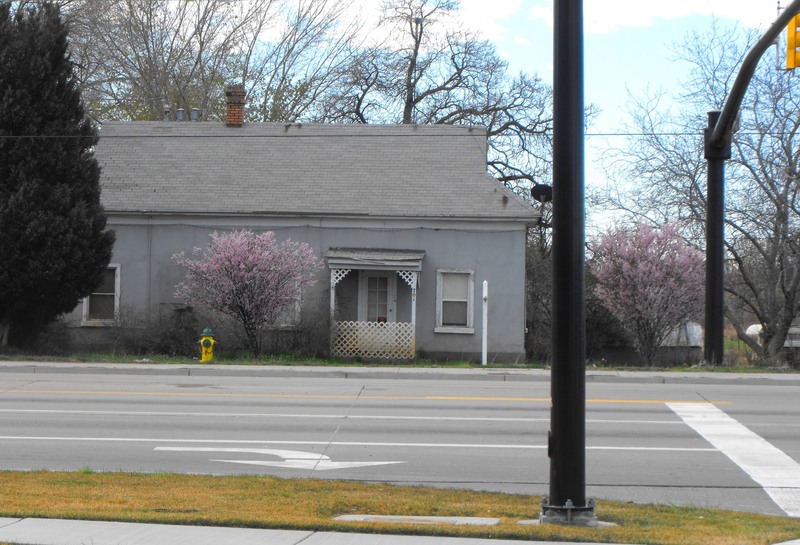 The home silk industry did produce silk cloth, but the project was unsuccessful financially so it was of short duration; however over the next two decades there would continue to be some silk production by the women of Weber County. Silas Tracy suffered rheumatism and in his later years was confined to a wheelchair. From this chair he directed his son in the farming and watering. 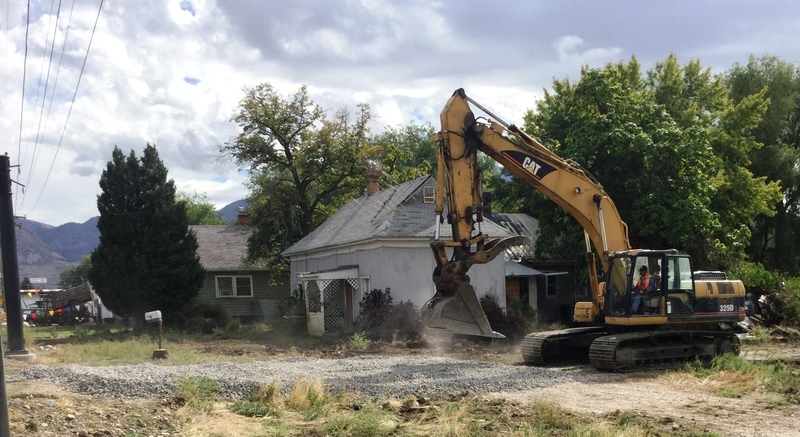 In 1878 there was a water shortage in Weber County, and arguments over water priority rights began coming to the forefront (see Ten Ditches and Mill Creek). One day while watching the head gate of the Tracy-Shaw Ditch in a wheelchair, a neighbor hit him over the head with a shovel. He never recovered completely from this unfounded attack, and he passed away in 1881 at the age of 51. Nancy Naomi Tracy was widowed a second time; she passed away in 1902 at the age of 86. Thomas Carter and Peter Goss, Utah’s Historic Architecture, 1847-1940, 1988, Utah State Historical Society, p. 18. Paul Huggins, interview by Anna Keogh, Ogden, Utah, 16 July 2008. Richard C. Roberts and Richard w. Sadler, A History of Weber County, 1997, Utah State Historical Society and Weber County Commission, p. 65, 69. Autobiography of Nancy Naomi Alexander Tracy, 1885, manuscript, p. 31,35. Charlotte Judd Tracy, Sketch of the Life of Fannie Marilla Garner Tracy, 1981, manuscript, p.3. History of Marriott, 1935, manuscript, posted http://www.johnmarriotths.org. Autobiography of Nancy Marinda Tracy Moyes (1860-1946), manuscript, p. 3; Fern Slater Devries, Silas Horace Tracy, manuscript, p. 3. Sarah Slater and Nellie Clark, Biography of Silas Horace Tracy, manuscript, p.3. History of Weber County Schools, A Social Studies Project of Weber Co. Schools, 3rd grade, 1966, p. 17. Fern Slater Devries, Silas Horace Tracy, p.2.